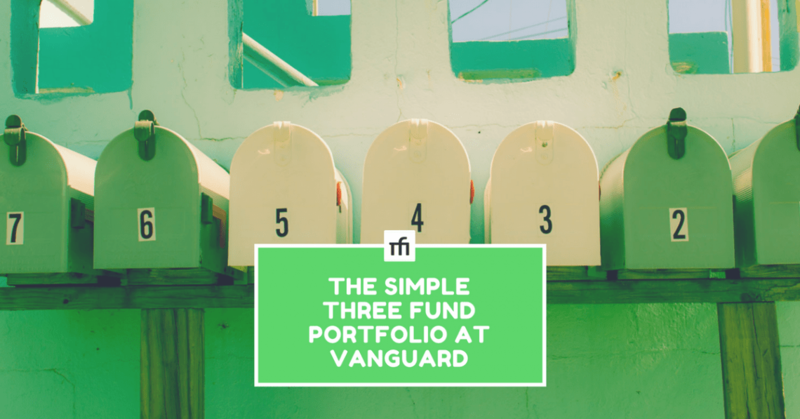 A super simple way to get started investing by walking you through how to create a Vanguard account and setup a three fund portfolio. Written by Adam on August 3, 2017. Updated April 24, 2019. 7 min read. Financial Independence, Investing. 13 comments. Investing is easier than it looks. In this post, I’m going to give very simple steps you can take to start investing including where, how much and what to invest in. Investing in this way has returned around 7% a year over the last century using only a three fund portfolio. This post is somewhat opinionated in the investing method mentioned here. It’s similar advice to what you’d read in books like The Bogleheads’ Guide to Investing, or other diversification strategies, but the specific actions are listed here to give a framework for those new to investing. The first step is to save up 3-6 months of your living expenses in a savings or checking account. In Which Investment Accounts Should I Use?, I mentioned this as the very first place save money. The next step is going to be to pay off your high-interest debt — namely credit cards. If you’re looking to invest and earn 7% a year, it doesn’t make sense to do it if you’re paying 15% in credit card interest. Take care of any debts above 7% first. Build on that emergency fund with another $3,000 in savings. This is an important number for Vanguard since this is the point where you can open an account with most funds there. Once you have this amount, head over to Vanguard and open account, linking your bank account. This process will take a few days, since Vanguard will make some deposits of a few cents into your account, and you’ll need to verify them. Once that’s done you’ll be able to invest within your new account! 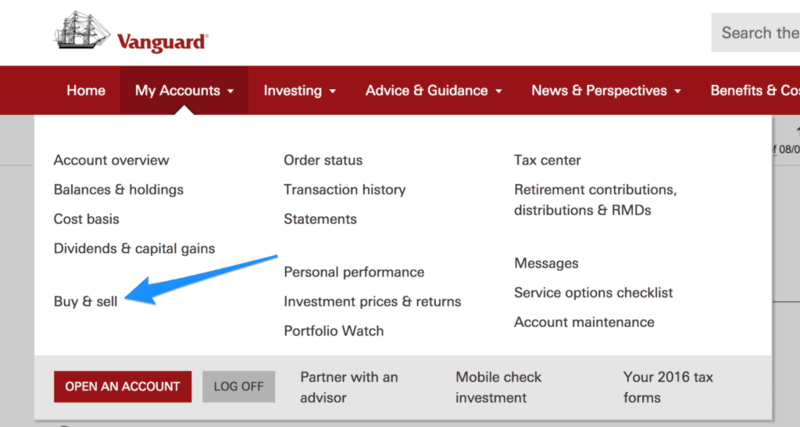 When your Vanguard account is created, and connected with your bank account, head over to the page to “Buy” Vanguard funds. The link to Buy Vanguard funds. Then choose “Vanguard Funds” from the list of options. This is probably the hardest part. I’m going to make it easy and list out the 3 major funds that I focus on within Vanguard. According to Marketwatch, this is the 2nd largest fund in the world. Investing in this fund means you’re actually investing in 3,606 different companies (at the time I’m writing this). This fund is focused on companies here in the US. The US has the longest history of growth in its stock market, and it makes sense for this to be your largest investment. Which bond fund I recommend you go with will depend on what type of Vanguard account you have. If it’s a retirement account, in an IRA, a Roth IRA or a 401k, I’d recommend Vanguard Total Bond Market Index Fund Admiral Shares (VBTLX). If this is in a brokerage account, it could help to read about my article on how to choose between accounts to better understand why I’d recommend Vanguard Intermediate-Term Tax-Exempt Fund Investor Shares (VWITX) instead. The idea is that is that this fund would result in less taxes for you every year — an important thing to keep in mind. When it comes to how much of each, some people will recommend 0% in bonds, while others will recommend “your age %” in bonds. 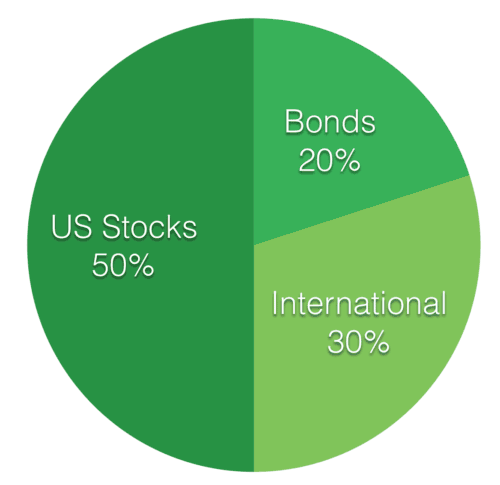 I tend to go somewhere in the middle and stick to around 20% bonds. That additional diversification means less variance in my portfolio and adds a bit more stability. Others wanting to maximize growth, and able to withstand large down periods (like 2008) could go 0% bonds, but that’s not me. Choose a percentage that works for you and click buy! In a few days, the transaction will be finalized and you’ll be able to view your investments from your Vanguard account. There are many places you can put your money – Fidelity, RobinHood, ScottTrade, E-Trade and dozens and dozens more. The reason I recommend Vanguard is because Vanguard is investor-owned. People who have investments in Vanguard fund the Vanguard business. This allows them to be autonomous and answer to their customers first rather than shareholders first. Fidelity and all the others are public or privately held companies with an obligation to their shareholders. This difference means that they will never be able to beat Vanguard in fees since they will need to make a profit at the end of the day. As a side note, Mutual Funds the way I go on Vanguard. From a fee standpoint, they’re both similar when you’re buying the fund from Vanguard. ETFs are actually slightly cheaper when you’re buying under $10,000 in any given fund (what Vanguard calls “Investor Shares”). Above $10,000 Vanguard has “Admiral Shares” for Mutual funds, which have the same fees as ETFs. ETFs are like stocks and can be traded at any time throughout the day. Mutual funds are priced once at the end of the day, and trades for them occur during off hours at the end of day price. Vanguard has a good write up the differences between mutual funds and ETFs. Why Not A Target Retirement Fund? Vanguard also offers these really great “Target Retirement Fund” Mutual Funds — for example Vanguard Target Retirement 2025 Fund (VTTVX). If you look at what this is invested in, it’s almost exactly the same as the 3-fund portfolio! It’s actually a 4 fund one — with the 4th being international bonds. This fund will change its underlying assets over time with the idea that by 2025 it’ll be in “entering retirement” mode — highly shifted to bonds. If you want to go this route, it’s actually not a bad idea. There are some downsides though. The Vanguard Fees will be slightly higher. The turnover within the fund will be higher (meaning that the underlying assets are being sold more often – resulting in more taxes for you). You can’t change your percentage of bonds vs international vs US stocks – you can only rely on them for that. The “target dates” get more and more conservative, while I’d likely maintain a 20% bond rate into retirement. This post isn’t an ad for Vanguard, although it does look like it. As I mentioned, Vanguard is owned by its investors (those who own Vanguard Funds), so I’m not getting anything out of it, other than knowing that your money is in good hands. If this post has been interesting, and you’d like to learn why I recommend Vanguard and these three specific funds, I’ve created a free 10-week Minimal Investor Course which helps teach the basics of investing — diversification, fees, asset allocation, taxes and more. If you’re looking to become an informed investor, I’d encourage you to check it out. Big Vanguard and VTSAX fan here! We just rolled over Mr. Adventure Rich’s former employer 403(b) to a Vanguard IRA a few weeks ago and we are thrilled with the lower expense ratios!!! VTSAX requires $10K initial investment. Afterwards, if I want to buy more, do I have to buy in $10K increments or can I buy less than $10K? Putting $10K for EACH contribution is a lot of money (at least for me). Good question! No, there is no minimum. If you want to put in $1 you can do that, and there will be $0 in fees – basically like adding money to a savings account. Vanguard has an “Investor” level version of this fund as well which only has a $3k minimum. For each you need to invest that much to get started, but if the value falls under the start amount you won’t be kicked off Vanguard. In cases where there are 2 levels (3k and a 10k level), Vanguard might automatically change your funds to the lower level, which has slightly higher fees. I searched for VTSAX from Vanguard website and it said “minimum investment of $10,000”, so I was curious. I haven’t open a Vanguard account yet. What is the symbol for VTSAX-like investment that only require $3K? Also, would you recommend this one over the VTSAX that require $10K? Hey Chuck! 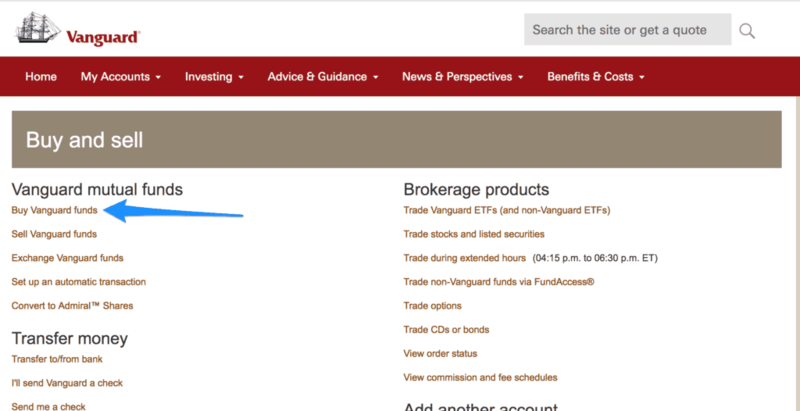 If you head over to the Vanguard page on VTSAX you’ll see a line at the top that says “Also available as Investor shares and as an ETF.” If you click on the investor shares link it’ll take you to the page on VTSMX, which invests in exactly the same things as VTSAX. The minimum amount needed for your first investment. The fee to be in the fund. I’d also recommend Admiral Shares if you have he money for them, but Investor are identical – and that difference in 0.09% is only going to be a about $9 difference (for $10,000). Because of this, it’s great to start with the investor shares – chipping in more as you have it. Once you get to $10,000, Vanguard will give the option to change funds. What’s even better, changing funds won’t be a taxable event (like selling funds) – they’ll just charge you less on their side. This is possible because it’s a mutual fund and not an ETF. 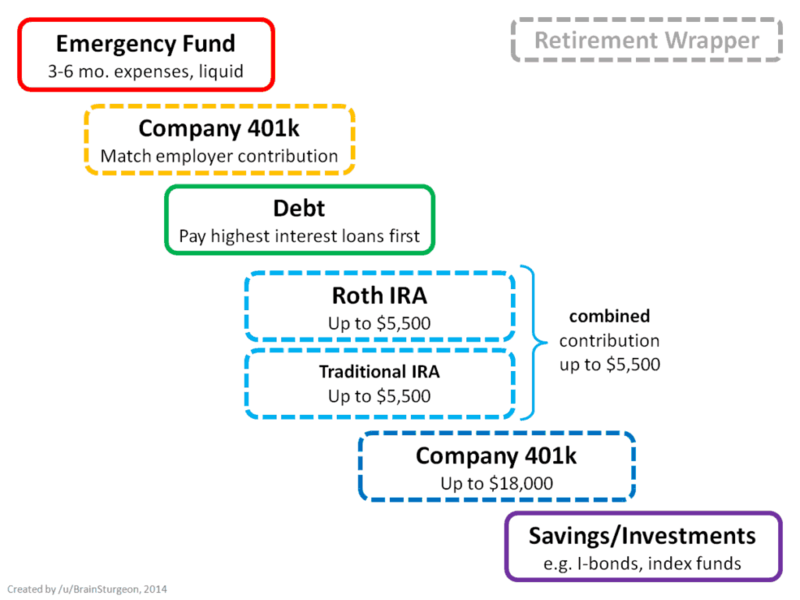 Thanks Adam – appreciate you sharing this guide, learned a ton already, i rolled over my previous 401K to Wealthfront since and since it was less than 10K no fees are being assessed (yet) but i have no control over it. I will go ahead and roll it over to Vanguard ASAP and probably use the targeted retirement funds. Great writeup and thanks again. All the best. Great resource you have here! Thank you. Regarding Vanguard options, why VTSAX and not VTI ETF? Same question for other suggestions- why not use the ETF equivalent? I’ve read so much of your stuff I apologize if I missed your previous explanation. Good question David! I wrote a bunch about this in the link below which dives into the differences between ETFs and mutual funds. I prefer mutual funds if the account is at Vanguard, or ETFs if the account isn’t. For instance, if you’re investing at Fidelity in a 401k, investing in a Vanguard ETF works great. For accounts I have full control over (like a brokerage or a Roth IRA), I choose mutual funds at Vanguard due to the ease of investing and some of the advantages mentioned in the article below. Hope it helps David! You said to save up 3k to start with Vanguard. In actuality with what you’ve outlined here it would be 9k due to each of these three funds having an initial investment minimum of 3k. A better strategy to get started with a well diversified Vanguard portfolio would be to select one of their Lifestrategy funds, which cost 3k to open and maintain a fixed allocation. Ohh yeah, that’s a good point. You’d need 3k to open the total market fund first – but you’d need 9k to start off diversified. For a Roth IRA/IRA starting with the lifestyle fund and then changing up when you had more is a great introduction – and people would get experience selling funds. You need more if you’re going to have the allocation that Bogle talks about right? Because if you have 3k in each you’re allocation is 33+% of each. How much money do you really need to get that good allocation he talks about?